The growing penetration of smartphones and tablets -- which are continually generating data about their user's location, activities and preferences -- means that these smart mobile devices have become a highly valuable advertising channel for savvy marketers. A case in point: in-app mobile advertising spend is forecast to reach $16.9 billion by 2018, that's up from $3.5 billion last year, according to the latest market study by Juniper Research. Growth will be driven by several key factors including improved targeting capabilities, as well as a trend for more effective interactive rich media ads to be deployed in preference to traditional static display advertising. The Juniper study uncovered that while smartphones currently account for approximately 70 percent of in-app advertising spend, the growth in tablet users and usage would propel greater medium-term spending. They also observed that tablet in-app ad spend would be further fueled by the fact that CPMs (Cost per 1,000 impressions) are significantly higher than those for smartphones -- particularly for rich media ads -- which also have higher CPMs than static display ads. By 2018, the tablet/smartphone advertising spend split will be almost 50/50. Juniper also observed that although app downloads will increase exponentially to 2018, the majority of in-app advertising expenditure is likely to be spent on ads with social mobile giants -- such as Facebook and Twitter. "As the mobile advertising industry matures, more sophisticated advertising solutions are being installed by leading players, with a clear trend towards utilizing location-based advertising to drive greater relevance. 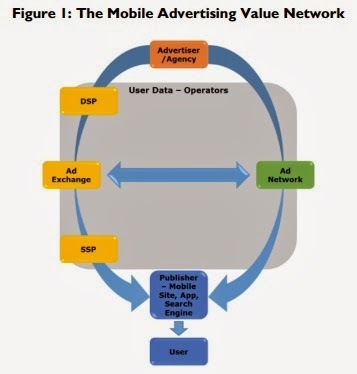 These new technologies and formats will benefit stakeholders across the mobile advertising value network," said Sian Rowlands, research analyst at Juniper Research. Global mobile advertising spend will surpass $39 billion in 2018, that's up from $13 billion in 2013. Rich media ad spend will surpass display advert spend in apps by 2018, as more engaging ad formats see huge uptake. Advertisers can increase conversions by simply adding mobile optimized features -- for instance a 'click to call' button, or by linking to the relevant app store.